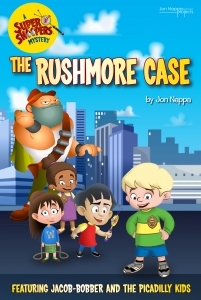 The illustrated Super Snoopers Mystery Readers Series is here and more volumes will follow. It’s one more component to the entire Snooper’s world of inspirational media for kids. Each of these approximately 90-page paperbacks present an exciting and mysterious detective story featuring the Picadilly Kids and, of course, Burt, Squirt and all of the Snooper gang. You can soon purchase them here in downloadable pdf form. 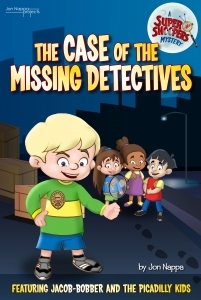 Burt and Squirt – the Town of Wellsley’s premiere detectives – are missing! Usually, whenever there’s a mystery to solve the famous detective duo leads the case, but not this time. Jacob-bobber and many more of the orphans from the Picadilly Place Orphanage must snoop out and solve the case all on their own. Of course, the ever-resourceful Professor Noodle and his faithful rabbit, Hosanna Hopper, provide additional help and gadgets. As the mystery progresses, it becomes clear it isn’t an easy task because Mean Mr. Poutndoubt and his trouble-making Blooper Battalion are never too far away with more than one trick up their sleeves. Having done an exceptional job of mystery-solving in their first case, Jacob-bobber and the Picadilly kids have been awarded honorary Truth Sleuth Badges and have already taken on their next case. This time it’s none other than Detective Harry Rushmore (alias Dirty Hurry) and he’s making a speedy mess of things with all the rushing around he inspires. Put on your detective badges, pick up your magnifying glasses and get ready to track down, analyze and snoop out a mystery that’s in way too much of a hurry!